The finial is a cheap resin piece that I found at a thrift store for $1.99. It was an ugly green, but I liked the shape. I spray-painted it with some fleck stone paint and then gave it a coat of Rustoleum's Heirloom White. Then I simply distressed it a bit with sandpaper. I think it looks cool now! The sphere is just a styrofoam ball to which I hot-glued preserved sheet moss. My WalMart now carries packages of sheet moss for a very reasonable price; it's in the craft/floral section. With the same package of sheet moss, I created these cute little birdhouses. The larger one is from Dollar Tree; the tiny one is from Target's One Spot. I spray-painted both of them Heirloom White, glued moss to the roofs, and trimmed the moss with scissors. Super-easy! The ivy plant is potted in an "aged" terra cotta pot that I made myself. You can read the tutorial for the pots here. The outdoor lamp I've had for years and years. My screened porch is a continual work in progress, but I'm happy with this tabletop now--with less than $8.00 and some spray paint from my stash, I think I've created a serene little scene. Since our porches get a lot of use, I love to decorate them with elements that aren't too precious. If one of these things breaks, there will be no weeping and gnashing of teeth. Do you decorate outdoor spaces? 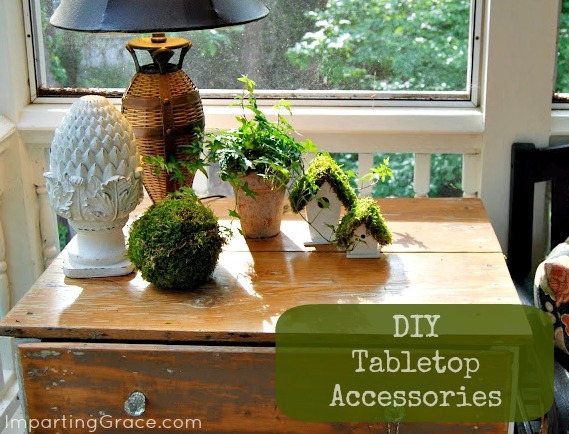 Do you have any ideas for pretty, inexpensive accessories? Please share! If I had a screened in porch like yours I would decorate it more than I do our back deck. Mainly I try to use lots of bright planters with colorful flowers in them. My husband and I have plans to string lights from one side of the deck to the other but Summertime really isn't the best time to hunt down Christmas lights. I don't want to spend a bunch of money on the cute summer lights they sell in stores. I love your simple decorations though. And such a great idea to make sure they are non-sentimental incase something happens to them. I cannot believe that finial was 1.99! It looks like a heavy, substantial piece now! It's the perfect spring/summer vignette! Also, I really enjoyed your post on defining success in blogging! I'm still new at it, but I'm finding it WAY too easy to get discouraged when I think about the typical metrics of success. But really, all I want is a "voice," even if the reach is relatively small. Big would be nice, but what I really want is simply to be a voice for good. I can tell we're on the same page, which is why I love your blog SO much. Keep it up, dear! Darling look, I absolutely love it. Those birdhouses are so cute. I love that you used all that moss. I've got to check it out at Wal-Mart. You porch is looking very inviting. The gazebo is still an skeleton as well as my garden set. Hope our Spring will come very soon *giggles. Very cute vignette, Richella. I love what you did with the birdhouses! Those are the cutest birdhouses with the moss added. Great look. Looks great! I didn't know Wal-mart sold sheet moss. Makes me want a screened in porch...sigh. Love it! Serene and best of all, the price was right! Nice job Richella:) Have a great evening! Your vignette looks so pretty. I love the color combination of white, green, and wood tones. Thanks for letting us know that Walmart now carries sheet moss. Wonder how long these will stay green? I hope all summer! Enjoy that porch this weekend. It should be a nice one. LOVE it, Richella! Sorry, we were traveling yesterday so I couldn't come on and comment although I did see this on my phone. The birdhouses with the moss roofs are so cute! We are just about finished with renovating our entryway and will need to decorate the Victorian mantle. Great ideas.